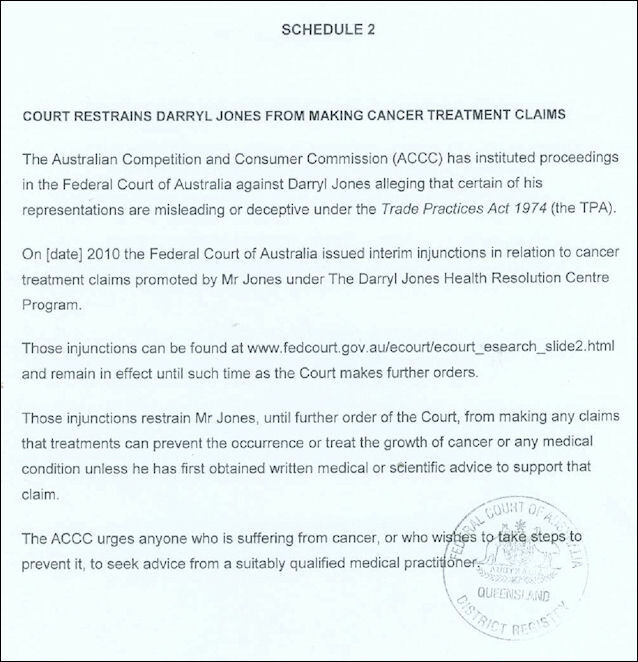 The Australian Competition and Consumer Commission has obtained interlocutory injunctions in the Brisbane Federal Court against Darryl Jones, principal of the Darryl Jones Health Resolution Centre on the Sunshine Coast, Queensland, over alleged misleading or deceptive conduct in connection with a cancer treatment program. were effective to treat or prevent cancers or, together with an exercise regime recommended by Mr Jones, preferable to conventional medical treatments such as surgery or chemotherapy. The injunctions stop Mr Jones, until the court makes further orders, from making claims that his treatments can prevent or treat the growth of cancer, or any medical condition. Mr Jones must first obtain written advice from an appropriately qualified professional certifying that the proposed treatment is, in the opinion of that person, supported by reliable scientific or expert medical opinion and is believed to be effective and safe. That advice must be disclosed to his clients, customers and the ACCC. Other orders require Mr Jones to write to his clients and customers and also display a notice on any websites he controls, owns or maintains, advising of the interlocutory injunctions. The ACCC urges anyone suffering from cancer or seeking to prevent it to seek advice from a suitably qualified medical practitioner. A directions hearing has been set down for 16 April 2010. Here is the notice that poor Darryl has been forced to run on his now-closed web site. The Australian Competition and Consumer Commission (ACCC) has instituted proceedings in the Federal Court of Australia against Darryl Jones alleging that certain of his representations are misleading or deceptive under the Trade Practices Act 1974 (the TPA). 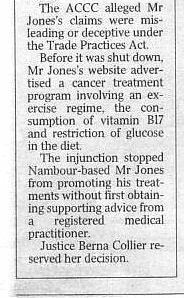 On 5 March 2010 the Federal Court of Australia issued interim injunctions in relation to cancer treatment claims promoted by Mr Jones under The Darryl Jones Health Resolution Centre Program. Those injunctions can be found at www.fedcourt.gov.au/ecourt/ecourt_esearch_slide2.html and remain in effect until such time as the Court makes further orders. Those injunctions restrain Mr Jones, until further order of the Court, from making any claims that treatments can prevent the occurrence or treat the growth of cancer or any medical condition unless he has first obtained written medical or scientific advice to support that claim. The ACCC urges anyone who is suffering from cancer, or who wishes to take steps to prevent it, to seek advice from a suitably qualified medical practitioner. In March I mentioned that a cancer quack named Darryl Jones had been accused of misleading or deceptive conduct when he claimed that he could cure cancer with cyanide and exercise. To rational people the case was closed as soon as it was mentioned that Jones was peddling that old favourite of quacks and charlatans, laetrile, and that therefore the Latin words ipso facto, a priori, mens rea and cloaca maxima could be applied without further thought. Darryl the death dealer wasn't happy with this, so he took the only course open to someone who makes scientific claims which are challenged - he ran to the lawyers and sought leave to appeal the injunctions preventing him from lying to desperate people and stealing their life savings and the inheritances they were planning to leave to their children. I will keep my eye on the court lists and let you know if he is granted the right to appeal, and if he is, how the appeal progresses. Occasionally there is a win for the good guys. Unfortunately this crook will stay out of prison, but these types never give up so maybe the next time he gets caught he will end up where he belongs. 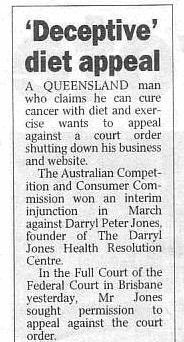 The Federal Court, Brisbane has found that Darryl Jones, principal of the Darryl Jones Health Resolution Centre, engaged in misleading or deceptive conduct in relation to certain cancer prevention and treatment claims. The representations were contained on the Darryl Jones Health Resolution Centre website (www.darryljoneshealth.com.au) and in an electronic book written by Mr Jones and sold through that site entitled The Truth About Overcoming Cancer. together with an exercise program, were more effective in treating cancer than pharmaceutical drugs, radium, surgery and chemotherapy. Mr Jones' treatment program included reducing or eliminating glucose from the diet and ingesting high levels of Laetrile (also known as Amygdalin) that is sourced in such foodstuffs as apricot kernels. The program cost $2,900 for the first three months and $1,500 for every three months thereafter. The court found that Mr Jones' claims were untrue, that he had no reasonable basis for making the representations and possessed no reliable current scientific evidence or expert medical opinion to support them. According to an expert oncologist engaged by the ACCC, whose evidence was accepted by the court, taking high levels of Laetrile can result in cyanide toxicity and glucose elimination can cause weight loss and imbalanced metabolism. an order that Mr Jones is to pay the ACCC's costs of the proceedings. In his judgment, Justice Logan found that: "the nature of the proven contraventions and the public interest tells decisively in favour of the granting of injunctive relief" and that such broad relief was appropriate as "Anything less would not offer adequate protection to the public in general and those suffering from or whose loved ones are suffering from cancer." ACCC chairman Graeme Samuel said the ACCC acted in the public interest to protect vulnerable people who are fighting serious or terminal illnesses. "The treatment promoted by Mr Jones was not only without a reliable current scientific or medical basis, but it was potentially dangerous as well. The ACCC urges anyone suffering from cancer to seek advice from a suitably qualified medical practitioner. "The ACCC could not seek penalties in this case as the conduct occurred prior to the introduction of the civil penalty regime which began in April 2010," he said. I don't usually publish the nice emails I get (I get a lot more of them than I do complaints and hate mail), but I thought I would make an exception in this case. Quacks aren't just a nuisance, they kill people and damage relationships. May I congratulate you on your site. I have found such valuable information from your site that I would not have found otherwise. My sister, whom we lost in 2008 aged 43 was a patient of Mr Darryl Jones. I live in Brisbane and my sister lived in Sydney at the time. She was undergoing chemo for about 6 months but after encouragement from her husband and his "psychic healer" my sister decided to give Darryl Jones a go even though her chemo was working well. We knew that the cancer would not be cured but at least we knew that we would have her for an extra few months. Not so - once she started her treatment with Mr Darryl Jones we lost her some 8 weeks later!!!!! Our family was very skeptical and we were the ones who drove her up and down the highway to Nambour, helped her with her exercise regime, cook and prepare her food and watch our poor struggle with his treatment plan. She had to literally starve herself. It was cruel, cruel, cruel and very unfair. He gave her and us false hope. Since we lost our sister her husband has cut our family from him and her three young children. Very upsetting considering we were a very close family. You see her husband was also "brainwashed" by his "psychic healer". His psychic healer actually referred us up to Nambour to see this dickhead Darryl Jones. Her husband believed that we did not push our sister far enough and helped in her demise because we did not "meditate" alongside our sister to help her. What a sad situation it all was and so hard for someone on the other side to believe this can actually happen. Hard thing is is my sisters children will also be brainwashed. What respect did he have from my beautiful sister?? None. I cannot thank you enough for your website and hopefully you will educate others and they will not have to experience what me and my family have.